Virginia is practically overflowing with exciting summer activities. With regular celebrations of the Commonwealth’s diverse culture, landscape, and history, one need not go far or for too long without a magnificent experience. Below you’ll find just 10 of our favorite summer traditions, but make no mistake: Virginia has even more than this to offer, so keep a keen eye out! The Hampton Roads area of Virginia is replete with summer fun. Tourists and locals alike visit the Virginia Beach Boardwalk for family-friendly fun. Norfolk’s Ocean View is well maintained by less traveled than the Virginia Beach Ocean Front. Sandbridge has a nice quiet beach and houses for a vacation. Hampton and the Eastern Shore offer amazing beach access, too. And if you prefer calmer water with tremendous historical importance, make sure to stop by the Chesapeake Bay. Join 300 artists in one of the “oldest and best outdoor fine art shows on the Eastern Seaboard” for a long weekend of one-of-a-kind crafts, incredible food, and musical guests. The festival begins on 17th Street and heads all the way down to 32nd with artist tents along the way. Get there early to find a parking spot, as the festival is one of Virginia Beach’s most popular attractions every year. The annual Chincoteague Pony Swim has been happening every summer since 1925. The wild ponies of Chincoteague were made famous by marguerite Henry’s “Misty of Chincoteague,” and are celebrated each year with a festival, games, live entertainment, and the culminating event of Saltwater Cowboys swimming them across from Assateague Island to Chincoteague Island. Stay through Monday to see the Saltwater Cowboys walk the ponies from the north to the south, where they will rejoin their brethren. Harborfest in Norfolk, Virginia, is “the largest, longest-running, free maritime festival in the nation!” Since 1976, the annual three-day Harborfest has attracted tens of thousands of participants for maritime-themed events, artisan food, and incredible live entertainment. Take part in the Build-a-Boat challenge, watch the Parade of Sail, and stay for the one of the largest fireworks shows on the East Coast. And, for the hot dog lovers out there, participate in a Qualifier Competition for Nathan’s Famous Hot Dog Eating Competition on Saturday. Music is part of the Virginian soul, and no matter where you are in the Commonwealth this summer; you’re not far from a festival. Stop by the Shenandoah Valley Music Festival to take part in the “longest running outdoor music festival in the mid-Atlantic.” The Mountains of Music Homecoming festival in Southwest Virginia “celebrates the rich traditional music heritage.” Floydfest in the Blue Ridge Mountains of southwest Virginia carries on for five days of musical fun. Stop by Richmond in August of the Richmond Jazz Festival. Finish off the summer with the American Music Festival over Labor Day weekend in Virginia Beach. In late August, Virginian’s celebrate the growing culture of craft breweries with the Virginia Craft Brewers Fest in Charlottesville, Virginia. Over 100 breweries are expected to provide tastings all day. The festival is family friendly, and includes food, live music, and, of course, delicious beer. Run by the Virginia Craft Brewers Guild, the festival is not one to be missed. Virginia is full of awesome theme parks, from the European inspired Busch Gardens to the 400-acre Kings Dominion. Water Country USA in Williamsburg, Virginia, offers wet and wild family fun in the sun. Ride roller coasters, partake in park food, and make memories that will last a lifetime. Virginia is one of the most historically rich states in the Union. Take advantage of your proximity to history this summer by visiting one of hundreds of historic sites. From battlefields, to presidential homes, to pioneer history and military memorials, Virginia’s historic interpreters bring history to life. Colonial Jamestown, Yorktown, and Williamsburg make up the “Historic Triangle,” and make for fantastic daytrips or overnight jaunts. Virginia’s diverse landscape ranges from the beautiful beaches of the Eastern Shore to the awe-inspiring peaks of the Shenandoah Valley. Hike up to one-fourth of the Appalachian Trail. Surrender yourself to the beauty of the Shenandoah National park, with more than 200,000 acres of hiking trails, before taking a drive through the mountains on Skyline Drive. For the most adventurous amongst us, Mount Rogers has the highest summit in the state at 5,729 feet. With eight mountain ranges in total, hiking lovers will find much to occupy their time this Virginian summer. 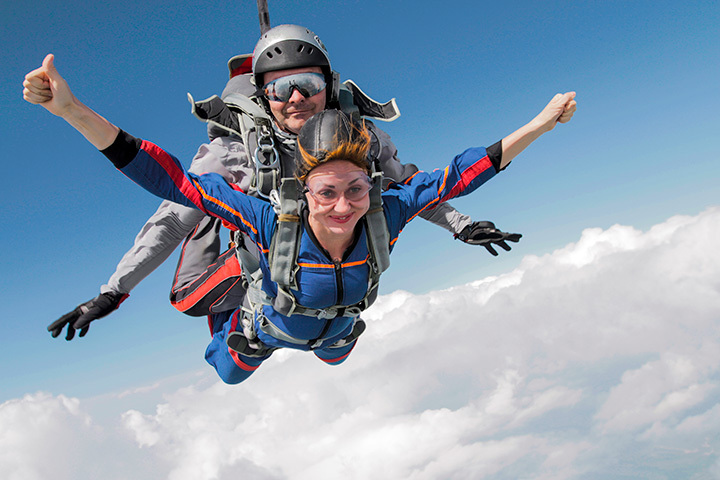 Take advantage of the gorgeous summer weather to get an aerial view of Virginia: skydive. While skydiving facilities exist throughout the Commonwealth, you might consider the Virginia Skydiving Center in Petersburg, Virginia, for its centrality to Virginia Beach, Washington D.C., and the surrounding areas. Learn the basics from their fully licensed team. Consider an accelerated freefell, instructor assisted jump, or a tandem skydive for first timers. What better way to enjoy the Virginian summer than from above?